Hello, all. NBB here again. 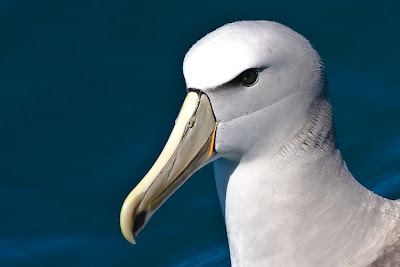 Sharon's off to Kazakhstan (from Frankfurt, where she could not, alas, find a frankfurter, only Viennese sausage), so it's time for our latest Birdorable guest blogging contest entry. 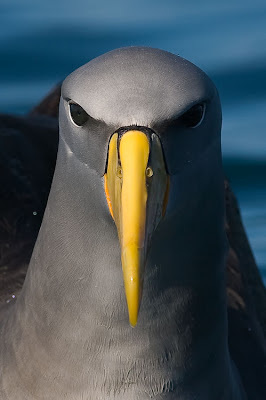 This one comes to us from Craig Nash of Peregrine's Bird Blog, an involves some close encounters with a very large sea bird. Having left Kapiti Island we stayed in Wellington with my father's first cousin Jan for a few days before we headed to the South Island and went our seperate ways. 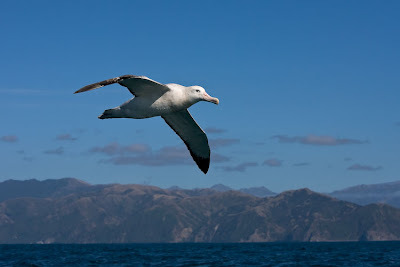 I wanted to see Albatrosses at Kaikoura and Kea in Arthur's Pass and my father wanted to visit friends and go fishing. 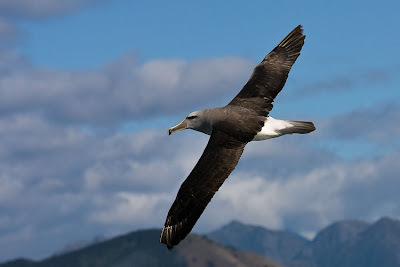 I arrived in Kaikoura and stayed in the Adelphi Backpackers Lodge.I had booked to go out with Albatross Encounter about a week earlier on the internet. I got up on a beautiful morning and headed to the Encounter building. I had made sure I had taken my seasickness tablets the previous night and an hour before we were to leave. 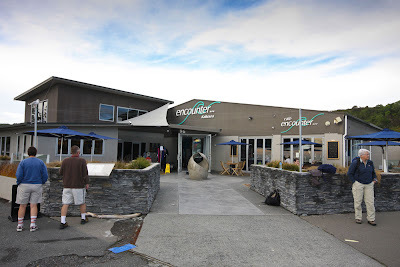 At the Encounter centre there is a really nice cafe serving excellent breakfasts and great coffee. so i had a quick coffee before our group of seven were to meet up with our guide Alastair Judkins. Alastair drove us from the centre around a headland to where we would board the boat. Pretty much the same as Kapiti we got onto boat and it was then reversed into harbour. We made our way out to an offshore canyon which is pretty close to the shore.It is about a mile deep. It is here that two currents converge and forces nutrient rich water upwards which in turn supports a wide variety of fish and marine animals creating a wonderful feeding habitat for many different species of seabird. 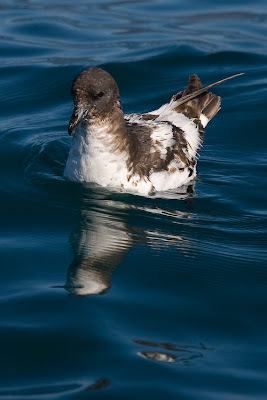 The first we were to see were the Cape Pigeon or Cape Petrel. They have a black and white colour and were named cape pigeons because they frequent Cape Horn. 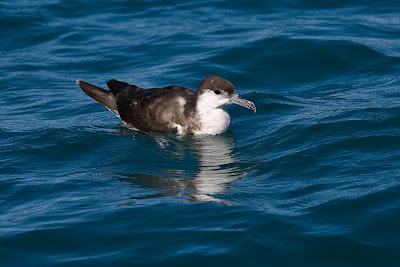 They are not a pigeon but a Petrel and in NZ follow fishing boats looking for scraps. Once we were over the canyon Alastair put a bag of frozen chum overboard and what felt like seconds birds were coming in all directions. 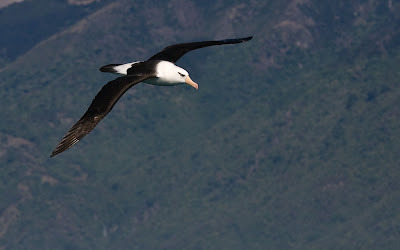 There were Great Northern Petrels, Mollymawks, Albatrosses and as they came in Alastair was pointing them out and naming them as they came in, as I was trying to photograph them. 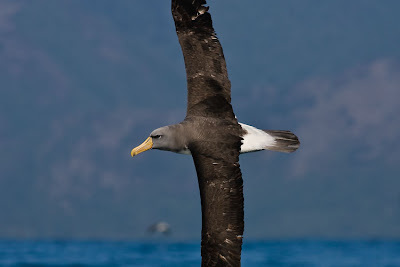 Westland petrel, Sooty Shearwater, White Chinned Petrel, Buller's Shearwater, Hutton's Shearwater, Salvin's Mollymawk, Gibson's Wandering Albatross. 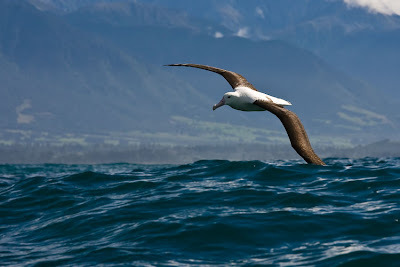 The shear beauty of these very large birds cleaving the water as they bank over the waves was awe inspiring. Also the backdrop of the Kaikoura Mountains made it all the more spectacular. 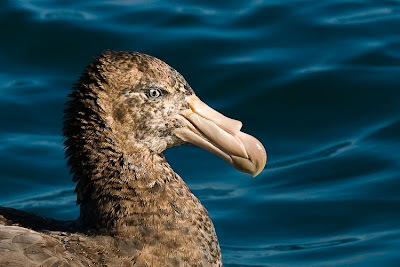 To me it was one of the greatest birding experiences I have ever had. 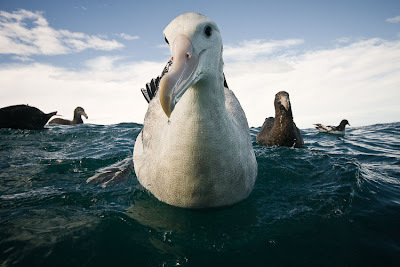 Alastair then shouted Chatham Island Mollymawk. 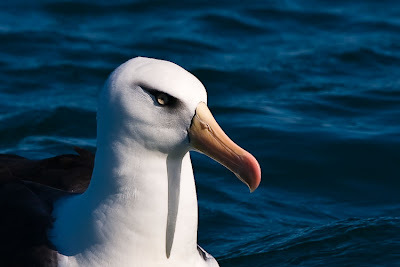 This had to be the bird of the whole NZ trip for me. 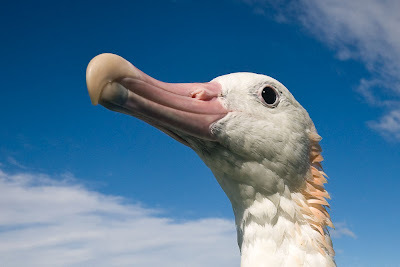 It is critically endangered on the IUCN red list. 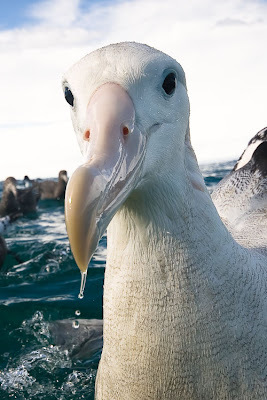 There are about 4500 pairs in the world and they breed on a rock called the Pyramid 800 miles to the East in the Chatham Islands. 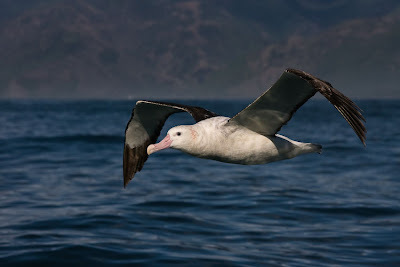 They would be a very rare visitor to New Zealand and this was only the third time in six or seven years that Alastair had seen one.It is one of the three sub species of Shy Mollymawk. 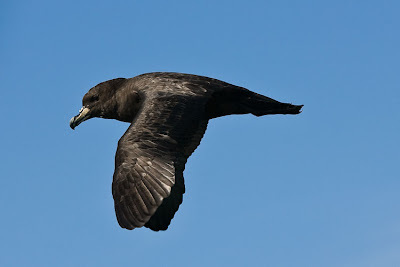 It flew round the boat before coming into land right next to the chum. It really was a beautiful bird. It then flew off not to be seen again. I then tried to take photos with my sigma 10-20mm lens with my camera body as low to the water as possible. I got a range of shots. 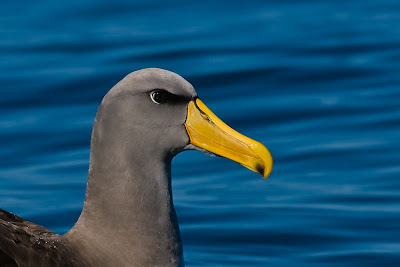 In this one immediately below the tip of his bill is only about an inch away from the lens!!! 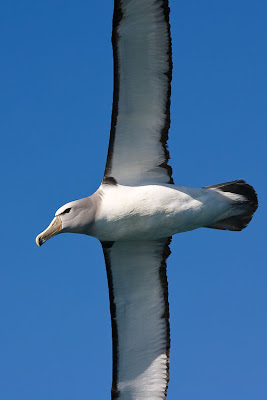 Then we were visited by a Black-browed Albatross of the Campbell Island Race. 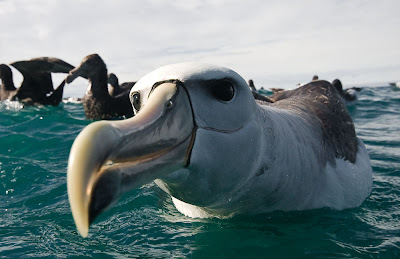 It is one of the most widespread albatrosses. It looks as though it is wearing eyeshadow. 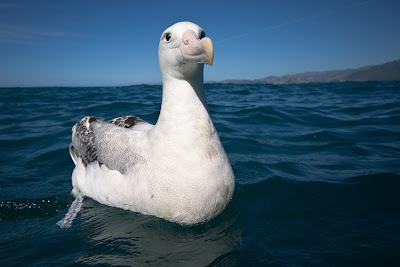 The only other Mollymawk we saw was a New zealand White -capped Mollymawk. This one is immature. 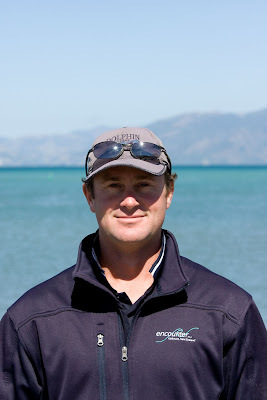 Alastair then headed to show us the Spotted Shag Colony on a rock just a few hundreds from the shore when we stopped at a group of Buller's Shearwaters sitting on the water. We looked and photographed them and then he chucked the remaining chum into the water. 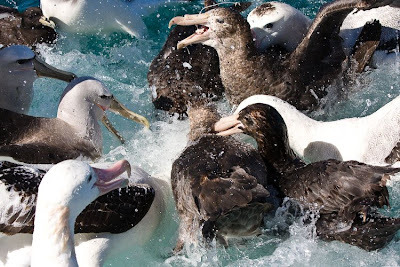 The albatrosses and the giant petrels went into a feeding frenzy.It was a pretty noisy affair. As a photographic experience it was second to none.It had to be one of the best mornings of my life. The next time I am in NZ I will definately go out on an earlier trip in the day to experience the early morning sunlight. 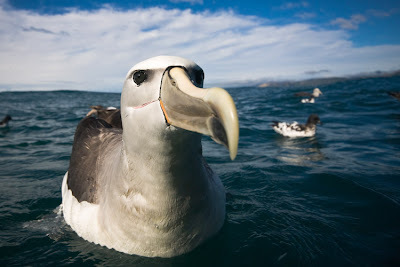 I would also love to photograph the birds from an underwater perspective. I entered this photograph, which I changed to Black and White, into the Birdforum Monthly Photo Competition (In this case the title was Monochrome Birds) and it won so I was pretty pleased with that.